The first Ohio Fish and Shrimp Festival was held in 2002, after the first crop of Ohio shrimp was raised the previous year. Dr. Dave Smith, President of Freshwater Farms of Ohio, wanted a way to educate the public on the health benefits of fresh seafood and the importance of preserving aquatic life, and have a little fun while doing it. So, the festival was born! One of the first festivals, held in downtown Urbana. 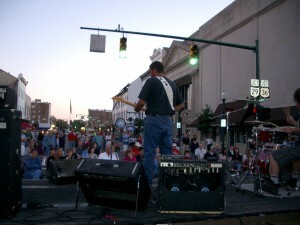 Now a three day event, the festival was originally one day only, held in the streets of downtown Urbana on a Saturday. The streets were blocked off and filled with displays of live fish, street-crossing fountains, games, vendors and live music. The festival crowds grew each year and so did the need for a larger venue. In 2005, the festival was moved to Freshwater Farms of Ohio, one mile north of Urbana, where it’s still held today. Why is the festival held on the third weekend in September? Freshwater Farms raises freshwater shrimp in local ponds. Shrimp… in Ohio? That’s right! Because these shrimp can only survive in warm water, they need to be harvested before the weather turns colder. There’s no way they would be able to survive a harsh Ohio winter. Shrimp are put into the ponds in June and harvested during the third week in September. Freshwater shrimp are comparable to “fresh-off-the-boat” saltwater shrimp and have a firm, juicy texture. They are also an excellent source of high-quality protein and are low in fat. Freshwater Farms’ shrimp are raised in clean, chemical-free waters, resulting in a healthier product that is locally grown. The week of the festival is the only week of the year that fresh shrimp is available for purchase. Freshwater Farms of Ohio is the state’s largest indoor fish hatchery, raising up to 100,000 pounds of fish yearly. The farm raises rainbow trout, largemouth bass, yellow perch, bluegill, channel catfish, fathead minnows, goldfish and koi. The fish are raised both indoors and outdoors and are available for stocking or as processed products. A century-old barn has been converted into a retail store that sells fresh rainbow trout fillets, popular smoked trout fillets and spreads, Ohio-grown products such as maple syrup and cheese. A wide variety of pond and water garden supplies, fountains, equipment and feeds are also available. Explore the farm during the festival to view numerous displays of live fish and other aquatic animals, learn about aquaculture, pet the endangered sturgeon, feed our trout and shop the retail store. Learn more about Freshwater Farms by visiting www.fwfarms.com. The Ohio Fish and Shrimp festival strongly supports local schools, churches and other non-profit organizations. All groups are welcome to set up a fund-raising booth at the festival free of charge. We strive to include as many groups as possible as a way for them to raise money to benefit their cause. To enter your organization, click here.